You are here: Home ∼ 2017 ∼ February ∼ 16 ∼ How Was the March 8 International Women’s Strike Woven Together? 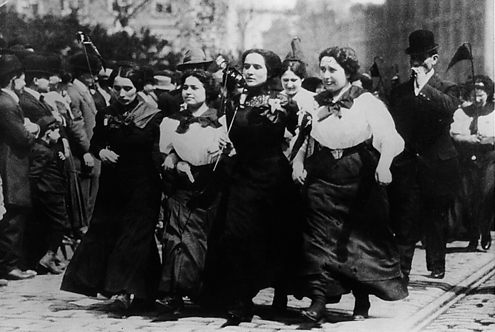 Mill workers in the Bread and Roses strike of 1912. Lawrence, MA. Last October 19, the call for a women’s strike to protest the femicide of sixteen year old Lucía Pérez, who was stabbed to death, connected male violence with forms of labor, economic, social, and territorial violence and precarization, and denounced them as a new “pedagogy of cruelty” on women’s bodies (in a scene with undeniable colonial echoes). The precursors to the massive demonstrations against femicides under the rallying cry Not One Less (#NiUnaMenos), which took place on June 3, 2015 and 2016 in Argentina, had demonstrated a strong mobilizing power. And over the last year, a network of coördination between different Latin American countries was already being woven. A new geography was drawn going from from Ciudad Juárez to Moscow, from Guayaquil to Warsaw and Sao Paolo, from Rome to San Salvador de Jujuy. The local and global fabric produced a new type of internationalism that was seen in the networks and in the streets – a new practice of feminist internationalism. An initiative is being coördinated through Facebook – the Paro Internacional de Mujeres/International Women’s Strike (PIM) – by a group of women in Poland, who have been joined by activists from various countries in Europe and other regions of the world. Along with a website, the Facebook group is also circulating a petition to the United Nations and a manifesto. We are committed not only to virtual coördination, but also to patiently weaving a new fabric, body-to-body and in the streets. We open up dialogues and work every day in constructing networks with all the countries of Latin America and with other parts of the world. Ni Una Menos Collective is a feminist collective against male violence, based in Argentina.